I told myself I wouldn't complain about the weather. This is Calgary. Every year the same thing happens - it snows - way after the time that you've purchased and worn your open toed shoes. Just live with it, or better yet, come up with an idea that will make you forget about it. And that idea came from someone who intimately knows the +15 level of downtown Calgary - my friend Wendy Lockhart, owner of Madison + PAGE, situated not coincidentally, on the +15 level of 5th Avenue Place. It was the word 'winter' that made her think of it. "Have you been to the winter garden?" She wasn't talking about the street scene outside. 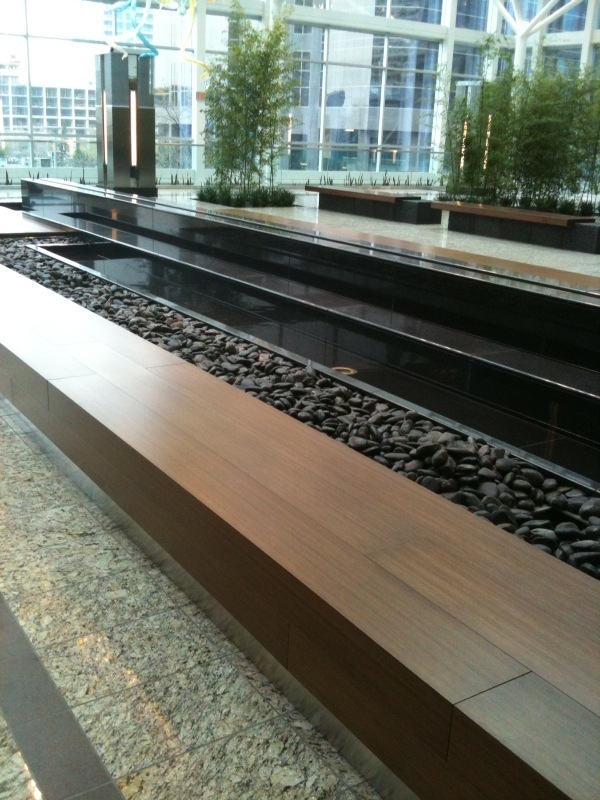 The winter garden is located on the +15 level of the new Jamieson Place building. Having pointed me in the right direction, off I went to discover the spot that would potentially help me forget about the weather. It worked. This place is amazing. A hidden gem of an indoor urban garden right smack in the middle of downtown! There were a few others who had also discovered it, and were nestled in a few of the numerous black leather chairs, book (or latte) in hand. There are a couple of things that stood out immediately. The first,hanging chandelier-like in the center of the space were 3 enormous glass-blown sea-creature-like sculptures by Dale Chihuly. The second, a massive back wall covered in thousands of plants (the information panel said 20,000 plants to be exact). They were arranged in a kind of patchwork pattern of squares. Stunning. I walked around the rest of the space, taking in the water feature, bamboo plants and carefully placed chairs, enjoying what seemed to be sunshine coming through the skylight and floor to ceiling windows on the far wall. Could it actually be sunny in here while its snowing outside? How can that be? Just an illusion? If you haven't been there yet, in your Calgary urban travels, I highly suggest you visit. Even on a snowy day in May. Maybe especially on a snowy day in May. Congratulations Maureen. Very well done.